PLASTER ROCK, NB, Feb. 26, 2016 /CNW/ - Fans and spectators at the World Pond Hockey Championship witnessed hockey history today when hockey great, Wayne Gretzky, set off Canada's Goal Light for the very first time and kicked off the official puck drop for the annual international competition. "As someone who has played hockey for Canada, there's no better feeling than the support of millions of Canadians behind you, encouraging and inspiring our country's biggest goals," said Wayne Gretzky, Canadian Hockey Legend. "I'm proud to be the first to sign Canada's Goal Light as it heads for the top of the world and I encourage Canadians to join me and support our goals this September!" More than 120 teams from 15 countries and over 8,000 spectators descended on Roulston Lake for the opening ceremonies and pond hockey tournament. 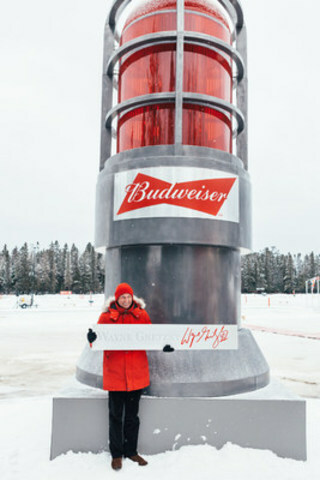 To mark the opening of the four-day competition, Budweiser Canada's 20-foot goal light made its very first public appearance in Plaster Rock, New Brunswick. On hand for the festivities, Gretzky was the first to have his name etched into Canada's Goal Light which will be onsite all weekend taking goal celebrations to the next level. Throughout the tournament, spectators can enjoy local fare and onsite activities from a variety of vendors and sponsors. "Our annual tournament attracts hockey's most passionate fans and it is incredible to see how it has grown year over year," said Danny Braun, director of the World Pond Hockey Championship. "This year's opening ceremony has definitely been unforgettable and we are honoured to play host to hockey's greatest and Canada's Goal Light." Originally created to raise funds for an indoor rink facility that has since been constructed, the World Pond Hockey Championship has now become a yearly tradition for over 200 local volunteers and teams from around the world. The tournament will conclude on Sunday when the top 32 teams compete for bragging rights, a trophy and their place in history on Canada's Goal Light. Canadians can visit Budweiser.ca/CanadasGoalLight to find out how they can add their name next to Gretzky's and show their support. Image caption: "Wayne Gretzky, shown here with Canada's Goal Light, made a surprise appearance in Plaster Rock, New Brunswick to kick off the World Pond Hockey Championship". The World Pond Hockey Championship event began and continues to this day to be a fundraising activity for the people of the Tobique River Valley. From humble beginnings in 2002, the first annual event featured 40 participating teams from New Brunswick, Nova Scotia, Prince Edward Island and Maine. Since its inception, the tournament has caught the imagination and triggered the emotions of hockey enthusiasts worldwide growing to over 120 teams worldwide. The World Pond Hockey Championships play host to teams representing every province in Canada, 35 American states and 15 countries from around the globe.